This has been an intense deadline week for me. I normally like to have a new recipe out to all of you by Thursday morning, but here it is Friday at 8:00 am and I am only now getting a chance to sit down at my computer and focus on this week’s posting. Regrettably, that’s happening from the exceedingly cramped quarters of seat 19H on American Airlines flight 59, en route to San Francisco. I’m off to visit my stepsister Eliza and to meet her new, months-old daughter, Oona — a happy occasion and one I’ve been looking forward to for a while, though in the immediate term, what with the toddler crying behind me, and the fact that I can’t raise my elbow to type without it meeting the hairy forearm of my neighbor (he’s claimed the armrest, by the way), not the ideal scenario for creative inspiration. Still, a weekend approaches, and with it, countless opportunities for all of us to muck around in the kitchen, so I’m determined to push through my comfort issues and get this up and out to you before another day ticks to a close. 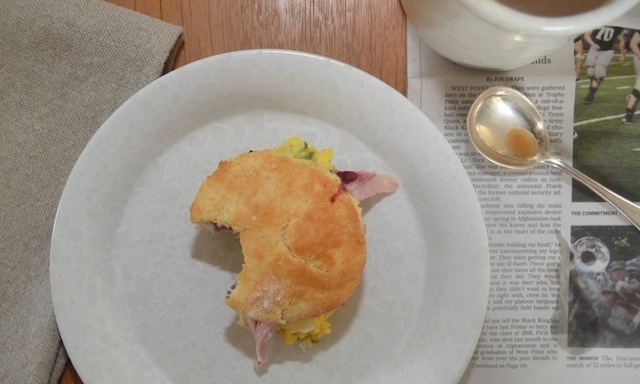 Or perhaps I should say, ticks to a start, since the focus of this posting is breakfast — specifically a breakfast biscuit sandwich. For the past several weeks, before my deadline was moved up and all hell broke loose, I’ve been obsessed with biscuits. I blame Sam Sifton for this, or rather his biscuit story that ran in the New York Times Magazine in mid-July, and which awakened in me not just a desire to slather a warm biscuit with butter and stuff it in my mouth as quickly as possible, but to duplicate the flaky, golden contours of the one featured in the alluring photo at the top of his piece. That image pretty much captured all the qualities I yearn for in a biscuit — the warm yellow tones, the accordion-like folds, and a slight sheen suggesting a buttery quality that manages not to slide into greasy. What’s more, neither of the two recipes presented with the piece seemed the least bit intimidating. I didn’t have to just imagine eating that biscuit — I could make it myself! But as I spun fantasy scenarios around my upcoming baking expedition, visions of the ideal breakfast sandwich also began to take shape. 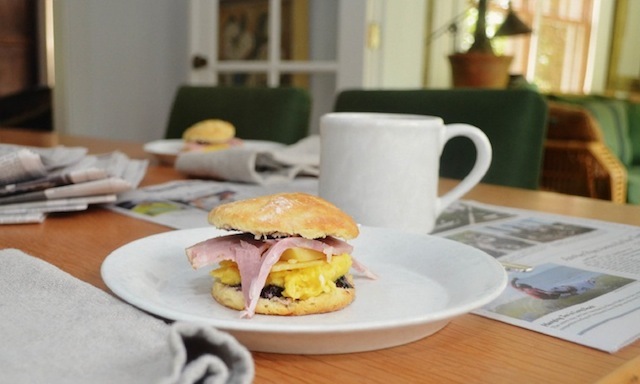 With the perfect biscuit now within my reach, perhaps I could fashion it into the ideal breakfast sandwich, as well — one layered with soft scrambled eggs, slices of country ham, chunks of sharp cheddar cheese, and to offset it all, a smear of strawberry jam. I couldn’t wait to get started! And so I did what you should never do with an untested recipe — I invited a few foodie friends over to try my new breakfast specialty, and the results were, well, not all that special. The ham wasn’t salty enough, the cheese didn’t have enough funk, and worst of all, my biscuits had barely risen off the cookie sheet during their run in the oven, giving me something closer to a scone. Had I overworked the dough (the cardinal sin in biscuit-making), or crimped the edges when cutting it into rounds? Or maybe the recipe was simply a dud. Except I liked the flavor — the balance of sweet to tang seemed right on target, and the texture was good, if a little dense. 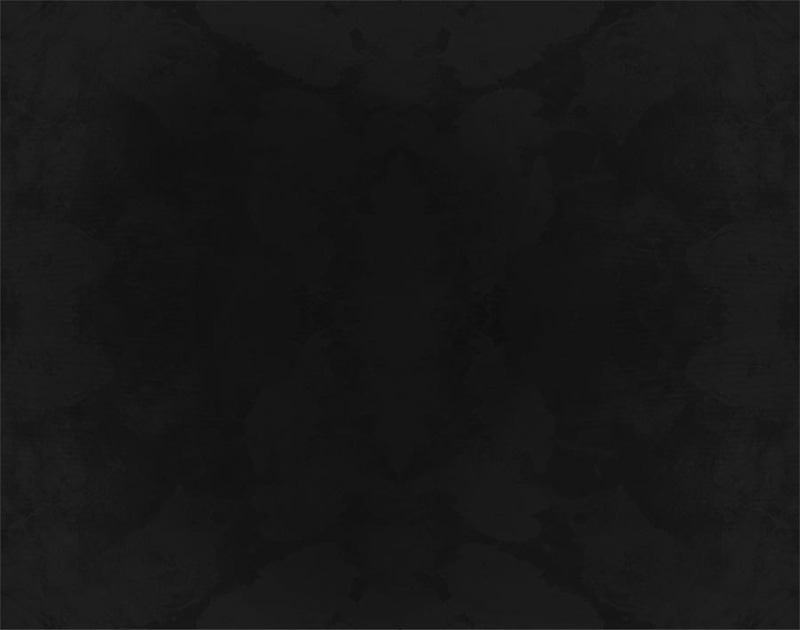 So I decided to try it again, but only after doing a little more research. And what I discovered is that when it comes to biscuits, there are countless opinions about the way to make them, along with a corresponding number of recipes. Variants includes everything from what ingredients to use (buttermilk, lard, and baking soda appear in some recipes, but are noticeably absent from others), proportions (some recipes call for 5 tablespoons of butter or shortening, others twice that), and technique (some say to flatten the dough with a rolling pin, others that one should only ever use one’s hands). Who knew this homely American classic was the source of so much controversy? So I absorbed as much of this information as I could and tried a few different versions, and in the end, for the purposes of the sandwich, decided to stick with the original recipe. Other of the recipes I tried might have come closer to the physical perfection of the Sifton version, but I liked the flavor of that first batch, as well as the simplicity of the instructions. These called for cutting 5 tablespoons of butter into a bowl of dried ingredients (flour, baking powder, sugar, and a little salt), then stirring in some milk, turning it a few times on a floured surface, then letting it rest for a half hour. I also liked that there was an emphasis on using the best ingredients, such as good European butter instead of lard, and that there was never any mention of a rolling pin. 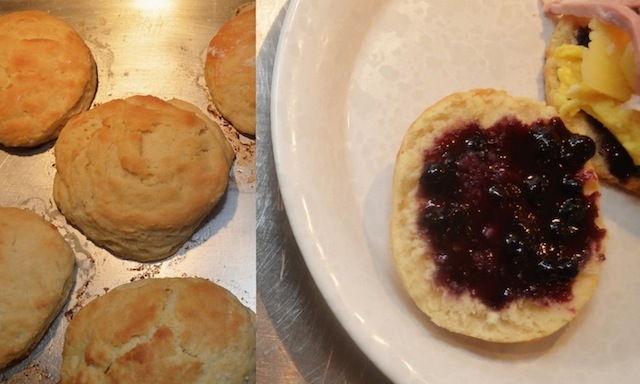 With my increased knowledge and experience I was ultimately able to produce a biscuit that had more height and air than the original — though in truth, never quite matching the scale I was hoping for. 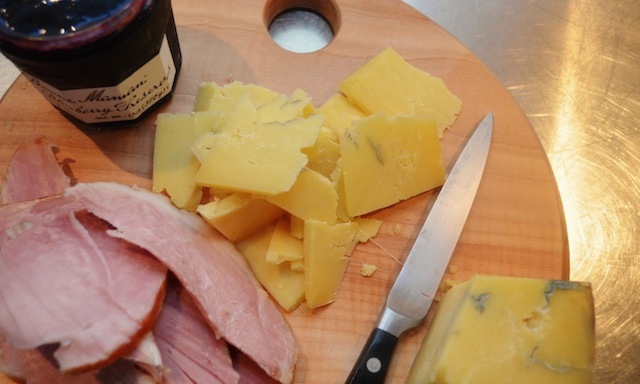 But with a saltier ham and a sharper cheddar now part of the mix, it made for something pretty wonderful. Biscuit-making dominance may still be in my future, but in the meantime I have one helluva of a good breakfast sandwich with which to comfort myself. Preheat oven to 425. Sift flour, baking powder, sugar and salt into a large mixing bowl. Transfer to a food processor. 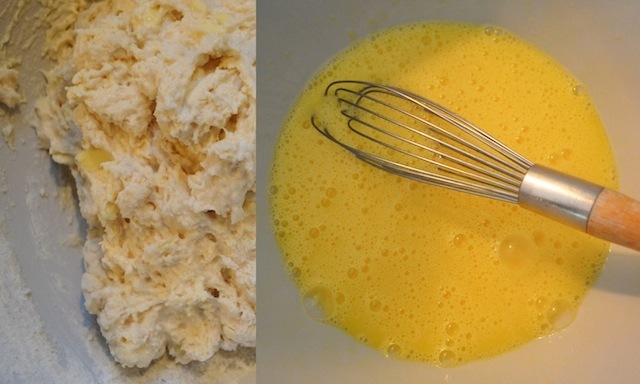 Cut butter into pats and add to flour, then pulse 5 or 6 times until the mixture resembles rough crumbs. 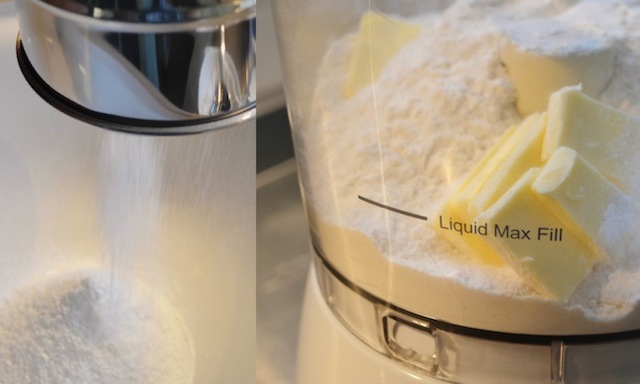 (Alternatively, cut butter into flour in the mixing bowl using a fork or pastry cutter.) Return dough to bowl, add milk and stir with a fork until it forms a rough ball. Turn the dough out onto a well-floured surface and pat it down into a rough rectangle, about an inch thick. Fold it over and gently pat it down again. Repeat. Cover the dough loosely with a kitchen towel and allow it to rest for 30 minutes. Gently pat out the dough some more, so that the rectangle is roughly 10 inches by 6 inches. 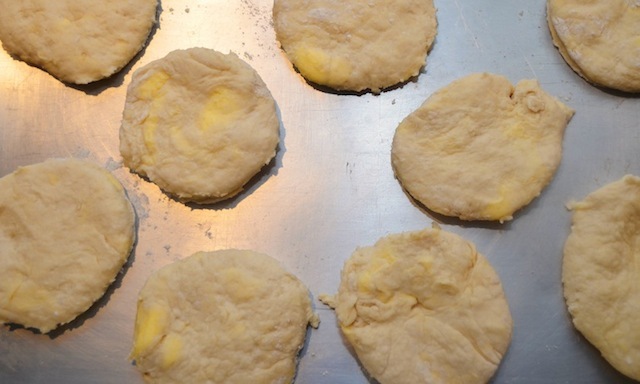 Cut dough into biscuits using a floured glass or biscuit cutter. Do not twist when cutting; this crimps the edges of the biscuits and impedes its rise. Place biscuits on a cookie sheet and bake until golden brown, approximately 10 to 15 minutes. Serves 6 to 8. NOTE: Biscuits can be made up to 8 hours ahead. Let cool completely. Store airtight at room temperature. Re-warm before serving. Great website.Your writing draws the reader in because we know the recipe guy is a living breathing perservering man whom with we can identify.Plus you have a a lot of humor going here cooking with the food.Really enjoy it.Lets see a true NY Pizza Stand recipe.Mazel Tov to your stepsister and her new child. I've modified the K.F.C biscuit a number of times. I used to make breakfast fair for our crew's at my work. I'm very experienced in the making of my biscuit. I personally like the look and texture, I'm gonna give it a shot. They look delicious. Thank you.